Aluminium pool fencing is an economical and popular choice for many projects because it’s low maintenance and durable. 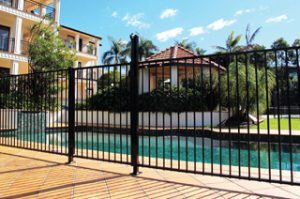 Our tough, rust free aluminium panels, gates and posts are made from 6063 T6 aluminium and exceed Australian Pool Safety standards AS1926.1(2012). All of our aluminium pool fencing products are available in a wide range of Interpon Powder Coating colours. We have streamlined our Pool Fencing range to include only the below four styles to ensure compliance with the new 2013 Australian Standard AS1926.1 for Pool Safety in Queensland. We stock a full range of gate hardware to complement our entire pool fencing range. Our hinges & latches are manufactured by D&D Technologies, home of the iconic Magna Latch range, with high quality fittings. Our team of estimators, project managers and installers are all experienced in working within the latest pool safety laws, ensuring project efficiency and peace of mind. Due to the nature of modern pool designs we offer custom solutions to meet the unique needs of your project including retaining wall panels and raked panels – all of which meet pool safety requirements. 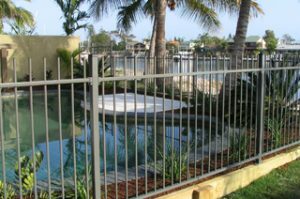 Our aluminium pool fencing is in stock or manufactured to order by Oxworks, Australia’s largest manufacturer and supplier of quality aluminium products. Their large scale manufacturing capability means we can offer industry leading production times on all custom fabrications, with AutoCAD shop drawings provided as standard on all projects. Frank Didovich, Cockram Project Manager for Azure Blue Project. Mick Harwood, FKG Project Manager for Quest Apartments Project.